Well, here we are at the beginning of FEBRUARY! Goodness last month got a bit away from me! But I did manage to finish three books as part of my personal goal to read more books this year. I then charged into Lauren Graham’s Talking Just as Fast as I Can. After binge watching Gilmore Girls over the holidays, I found this a fun read. She chronicles her struggles as an actress, all with her characteristic humor, and offers up some behind-the-scenes goodness from Gilmore Girls, Parenthood, and Gilmore Girls: A Year in the Life. I like her breezy writing style and thoroughly enjoyed this one. If you need something light-hearted, this is your read. 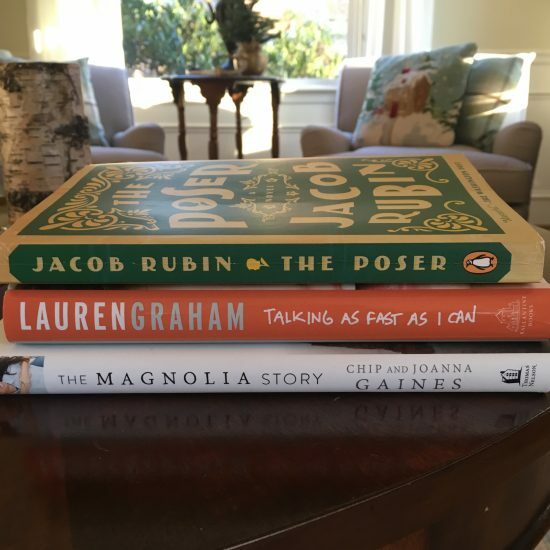 In the midst of those two, I read The Poser by Jacob Rubin. This was my book club’s pick for January and frankly is one I would never have picked up on my own. It’s a curious tale of a young man who impersonates others to the point that he has next to no identity of his own. Unfortunately I missed the discussion on this one, but I’m sure it was spirited. I ended up finishing it but not enjoying it — it was strange and dark and I felt like I was watching a train wreck and couldn’t look away. It’s a relatively quick read so I was glad I hadn’t invested much time. So my reading goal for the new year is off to a good start! Next week I’ll be sharing my list of books I’d like to read. What have you been reading lately? Please share in the comments!